How can it be moral that through the mere accident of birth some people are imprisoned in towns and suburbs where their financial and geographic constraints prevent them from making a living? That open borders within countries does not automatically eliminate poverty reminds us be skeptical of claims that opening borders between them will reduce poverty automatically. This is an interesting point, but there are a couple things to keep in mind. First, what do we mean by “poor”? Poverty in the rich world is a very different beast from poverty in the poor world. The poorest five percent in America still make $3 – 4000 per year, putting them in the 60th percentile of global income. 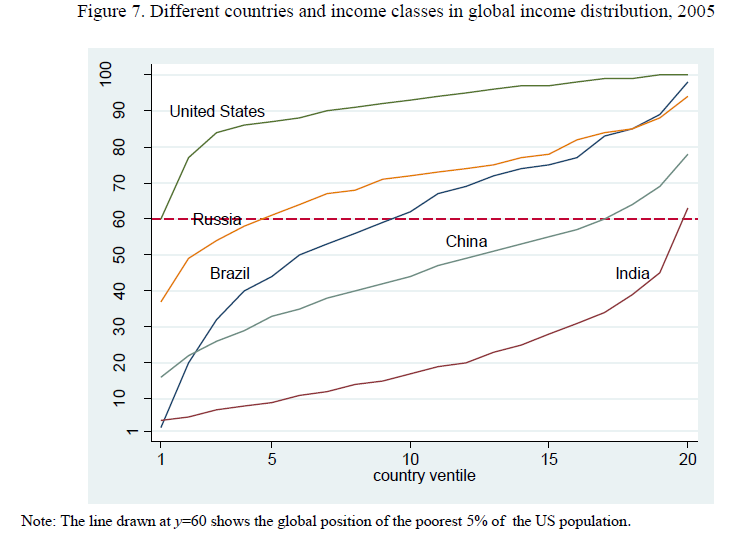 (Milanovic 2012, see figure below) This doesn’t mean that rich world poverty isn’t a problem. But even if migration opportunities only help people in, say, the 50th global income percentile and above, that means helping people we would normally think of as poor without qualification if only they already lived in the rich world. So, yes, opening borders will pretty much automatically reduce poverty, even if it doesn’t eliminate poverty. This point can be turned around the other way. Would we be richer if we had less mobility in the rich world? As Lant Pritchett has discussed, mobility allows people to escape the traps of ghost towns and dying industries. Would we even ponder restricting the out-migration of West Virginians to the rest of the US or Tasmanians to the rest of Australia as a strategy to improve the lives of the poorest in those regions? In the dying towns and sleepy suburbs of the rich world, it is also the poorest who will have the greatest difficulty taking advantage of their freedom to move away. But no one suggests imprisoning less disadvantaged people in their dying towns to be fair to the most disadvantaged. Open borders is merely the logical outcome of any type of ‘natural rights’ moral reasoning. People should have the opportunity to flourish irrespective of the patch of Earth they were born. [sic] Yet the idea boils down to being the policy you support when you want to help the world’s poor but don’t support actually giving them money. This seems a bit ad hominem to me. Open borders is merely a libertarian idea, pushed by rich folks and their shills who want to reap the status benefits of advocating a policy that would allegedly benefit the poor without having to actually fork over any cash. I’ve wondered before why it is so commonly thought that a policy of open borders must be at odds with a policy of global redistribution of wealth. I see no reason why an earnest leftist couldn’t support allowing everyone in the world freedom of movement and at the same time support redistribution from the rich to the global poor. There’s no inconsistency, and no readily apparent reason why the two policies would conflict. In many ways open borders is the type of policy you support to display street cred in the company of the economically rational, particularly when discussions turn to inequality and, god forbid, redistribution. Making the poor richer is as simple as giving them money and therefore access to resources, whether they are fellow citizens of your country, or your planet. Well, this certainly sounds simple. Simply handing cash to the poor is a good idea, and we should all do a good deal more of it. (On this note I can’t resist observing–anecdotally–that many of the people I know in the open borders movement are also very interested in “effective altruism“, including direct cash disbursements). The reasons why global poverty is not actually this simple illuminate why, despite what I said above about compatibility, I personally think tax-based redistribution is a bad idea. It’s perfectly consistent to hold this view along with a preference for free movement, but it’s a view I don’t actually endorse. There is a strong case to be made that simply handing cash to the wretched of the earth is one of the best ways to get the most bang out of your altruistic buck. It allows the poor to make one-time life-improving investments (a metal roof, a bicycle, etc) that can ease the immediate pangs of poverty. But it isn’t at all clear that this can be scaled up without the cash becoming yet another resource to be diverted to and exploited by the same local kleptocratic elites that already impoverish poor societies. I am presuming of course that Rumplestatskin envisions ramping up aid going through official channels. Control of the aid spigot can also become a source of conflict, just like oil fields and diamond mines. And like oil and diamonds, foreign aid can potentially inflict a resource curse on an imbalanced economy. This isn’t to say that foreign aid is always bad. The evidence to my knowledge suggests that foreign aid contributes weakly to economic growth and can improve non-economic outcomes. But it is neither simple nor without danger. These considerations should give even the committed redistributionist pause. Finally, there is the coercive nature of global redistribution. Such redistribution involves levying taxes on individuals in rich countries in order to transfer funds to people they have never met and know very little about, through murky and what are likely to be perceived as illegitimate channels, with little guarantee that the funds won’t be compromised by the problems above. Of course, all taxation involves coercion with no guarantees of efficiency. But these are the qualities that make tax rates and redistributive policies so contentious even within domestic politics. The justification requirements only increase with international transfers. These aren’t necessarily insurmountable hurdles. The severity of global poverty is significant enough to override most aversions to higher taxes–including my own–but only if the rich world taxpayers can be sure those taxes will do some good. Contrast this with liberalizing immigration to the rich world, which removes coercion from current policy. One can argue about economic effects on the poorest individuals in both the sending and receiving countries, and one can make vague arguments about changing national character. But for the individuals directly affected, open borders reduces coercion and expands opportunities. Would migration levels under open borders be optimal, too high, or too low? A common criticism of free markets is that due to market failure, the level of supply of a particular good or activity may be too high or too low. Of course, this isn’t necessarily a case for government intervention. Governments may fail too: they may exacerbate the problems further, overcorrect in the other direction, or introduce a new dimension of problems. But the question of market failure is worth considering, whether one comes up with a governmental solution, non-governmental solution, or concludes that there is no solution. The question for migration: under open borders, will the level of migration be optimal, too high, or too low? The majority of open borders supporters (or at least, those who consider the question sufficiently well-posed) probably adhere to the view that the level of migration under open borders would be closer to optimal than under the status quo. That still leaves open a range of possibilities for the situation under open borders: perhaps there is slightly more migration than optimal, or perhaps there is slightly less, or even a lot less, migration than optimal. Most open borders skeptics who consider the question well-posed (and particularly those coming from a universalist angle) probably feel that the amount of migration under open borders is a lot more than optimal (hence their support for migration restrictions). I will lay out some possible reasons why there might be “too much” or “too little” migration, though it will be difficult to arrive at a conclusion. In future posts, I might talk more about how to weigh the considerations and how to address the issues raised. UPDATE: Mike Carey points out in his comment below that (1)-(3) in my list refer to ways that the migrant miscalculates his/her personal gain or loss, whereas (4)-(6) in my list refer to ways that the migrant fails to account for effects on other people. Some prospective migrants may benefit greatly from migrating, and wish to do so, but the upfront cost of migrating may be so high that they literally cannot afford it. Joel Newman discussed this case in his recent post. Prima facie, I don’t see this as a big issue long-term: I expect that to the extent that people care deeply about migrating, loans (repaid through greater post-migration earnings) and private charity will help fund the upfront costs. The catch: people need to be sufficiently eager to migrate to avail of the opportunity of a loan (along with the attendant liabilities). But the failure to do so is more a problem of hyperbolic discounting (next on our list) than of an inability to afford the move. Intranational migration, or the lack thereof, offers important lessons. There’s a great deal of intranational migration, but a lot less than one might naively expect given the cost-benefit analysis, raising the possibility that wealth effects constrain intranational migration, and therefore are also likely to constrain international migration under open borders. Both the 0% interest loans and the conditional cash transfers led to large increases in seasonal migration, while “information only” treatment had no apparent effect,7 leading the authors to combine the cash and credit groups and information only and control groups into “incentivized” and “non-incentivized” groups, respectively, for the remainder of their analysis. In the year the study was conducted, incentives led to a 22 percentage point increase in migration on a baseline level of 36% in the non-incentivized group, a 60% increase.9In the following year, when incentives were no longer provided, migration was still 10 percentage points higher in the villages that had previously received cash or credit incentives. Three years later, an 8 percentage point increase persisted in these villages. This increase in seasonal migration led to large and well-identified gains for the families of migrants at the origin, who benefit from remittances. People value the future less than the present. This isn’t considered ipso facto irrational. Economic models typically use exponential discounting. Roughly, this means that the ratio in which you value today and tomorrow is the same as the ratio in which you value tomorrow and the day after tomorrow. In other words, a constant increment of time leads to a fixed proportion change in value. In practice, though, people tend to engage in hyperbolic discounting. They value the present highly, and the future a lot less, but the proportional dropoff from the present to the near future is much greater than the dropoff between dates in the future. In other words, people value their present a lot more than their selves six months into the future, but they’re pretty much indifferent between 30 months in the future and 36 months in the future. Hyperbolic discounting is not invariant under time translation and therefore leads to dynamic inconsistency. What this means in practice is that people might avoid migrating now because of the huge upfront cost, even in the face of numerically larger benefits within six months of migrating. On the other hand, if they are asked now whether they’d be willing to migrate 2.5 years later to achieve huge gains 3 years later, they are more likely to express willingness. Hyperbolic discounting isn’t a problem per se if people have access to commitment devices that can allow them to force themselves to migrate at a later date (a bit like Save More Tomorrow). But such mechanisms are hard to develop and implement without morally impermissible coercion, particularly for a weighty decision such as migration. This argument points in the direction of there being far less migration than people would like from a non-present-biased vantage point. It seems clear that many immigrants chose to immigrate in-order to obtain better economic standing. Surveys from around the world have found that improvements in their material condition is the first thing people list when asked about how their lives might improve. They think that they will be better off if they have more money. This is an area in which immigrants might plausibly make a mistake: they overestimate the importance of absolute wealth to their well being and in so doing under appreciate other factors, such as their relative wealth and their sense of belonging in their community. First, I am going to look at the relationship between absolute income, relative income, and happiness. To be clear, relative income is how much money you make relative to the people around you. If you live in a third world country and make a third world income then you have a pretty average income relative to the people around you. If, on the other hand, you move to a first world country, you could have a significant increase in the total amount of money you are making and still be making less money than the people around you. That is, you can experience an increase in your absolute economic standing and a decrease in your relative economic standing. And if relative income is more important to your mental well being than absolute income is then you could experience a decrease in happiness as a result. Some of the most important data on this topic has been documented by economist Richard Easterlin. He has documented that, over the course of the twentieth century, the absolute income of people in the United States more than doubled. Yet, levels of life satisfaction haven’t increased in any substantial way. What this suggests is that absolute income effect on life satisfaction isn’t very large. Similarly, following the second world war Japan rose from a third world nation to one of the richest nations in the world in about 30 years. Over that period, Japan’s GDP per capita increased fivefold and major lifestyle changes were experienced by Japan’s inhabitants as they rose from international poverty to affluence. Yet, average reported levels of life satisfaction in Japan remained unchanged. Further still, an analysis of economic growth and life satisfaction in 9 European countries over a 16 year period found no relationship between economic growth and changes in happiness. A similar relationship exists between individuals happiness and changes in their incomes over their lifespan. Several studies have shown that individuals do not typically experience an increase in happiness between the ages of 20 and 40. And yet, their income increases substantially over that same time period. In-spite of all this data showing that individuals can experience massive changes in their absolute wealth with no corresponding change in their mental well being, many studies have found that there is a correlation such that the more money people have the happier they are. One way to explain this finding is by positing that the people who end up with the most money are the happiest to begin with and that their income is therefore not the cause of their happiness. There is some good evidence for this position. For instance, in one study researchers interviewed around 15,000 participants at ages 16, 18, and 22, and obtained information on their income at age 29. During the interviews in adolescence and young adulthood they assessed how happy the participants were and preformed a statistical analysis to see if happiness at this earlier period predicted income at age 29. What they found was that not only did happier people go on to make more money than less happy people but that happier siblings grew up to make more money than their less happy siblings. This means that coming from a wealthy family cannot explain why happier young people end up making more money. After all, siblings come from the same family. Thus, the correlation between happiness and income is partially explained by the fact that people that are happier to begin with make more money. On a related note, see the article on the Gallup website titled Worldwide, Migrants’ Wellbeing Depends on Migration Path. I think that revealed preference says a lot, not just in that people choose to migrate, but that they don’t choose to return, and that people continue to migrate even after learning of conditions in the area that they want to migrate to. If anything, migration tends to increase with the presence of diasporas. It is more likely that people’s attempt to provide a numerical estimate of their happiness level is based on relative wealth and other considerations, whereas their actual happiness levels correlate with actual wealth. One’s absolute level of wealth may not be important, but the opportunity to earn wealth might matter. People who have this option, and then choose not to exercise it, may not be too unhappy. People who choose not to exercise the opportunity still benefit from its existence, insofar as they are making a conscious tradeoff. One reason why people’s happiness predicts their future income is that people are aware of their future income, and make present life choices, including choices of consumption levels, taking that into account. If you know your salary ten years from now will be millions of dollars, you have less inhibitions taking out a bigger loan to buy a bigger, better house. For most jobs, doing the job benefits not only the person doing it but also benefits other people, including the person’s customers, employers, and (perhaps) co-workers. People who migrate to take up a job with higher productivity are likely to increase their own income, but in addition, they’re also likely to benefit the people around them to a greater extent than they did with their earlier job. The increased flow-through effects, spillover effects, and externalities are something that people may not consider in their personal accounting. Thus, they may migrate less than they “should” from a universalist perspective. In particular, as Carl Shulman pointed out (continuing on a theme I blogged about), economic models focused on finding arrangements that are most economically efficient routinely predict substantially larger migration flows than polling data indicate, and it’s believed that the polling data themselves are either about right or an overestimate. Flow-through effects and externalities should be internalizable through compensation: for instance, employers can pay relocation costs for workers, and local governments can give special tax breaks to people when they move (similar to the discounts that subscription services offer for the first few months). However, there may be practical problems associated with compensation mechanisms. Concerns such as brain drain and delay of the reform of political institutions might lead to more migration than is optimal under open borders. One culprit is wealth effects: people in poor countries can pay less (for the same subjective benefit) to their doctor than people in rich countries. When a doctor moves from a poor country to a rich country, attracted by a higher income, the doctor’s private gain might overstate the social gain from migration. Note that the claim here isn’t that brain drain justifies the status quo, or even that most skilled migration is bad, but rather that complete free migration might lead to somewhat more skilled migration than is socially optimal. Then, of course, there’s the concern about killing the goose that lays the golden eggs. Migrants have to pay both the upfront costs of moving and the costs of adjusting to a different culture (this may include learning a new language, familiarizing oneself with a new culture, or adjusting to new types of work). Their children, born in the new country, however, do not need to “adjust” in the same sense, though they do need to juggle the somewhat different cultural and linguistic traditions of their parents and the ambient culture. The grandchildren face even lower adjustment costs. In the case of migration from poorer to richer countries, the children and grandchildren can acquire more relevant skills and human capital early on in their lives, and therefore have greater earning potential than the parents. In other words, the place premium for migrants understates the long-term gain from migration because the place premium only accounts for improved earning capacity of migrants without a change in their skill level, whereas their descendants have an opportunity to acquire more skills right from childhood. It is thus likely that prospective migrants are less willing to migrate because they give insufficient weight to the life satisfaction and earnings of their descendants, particularly their as-yet-unborn descendants. For a somewhat extreme example, consider Africans who were brought to the United States as slaves in the late 18th century. They were brought against their will, and the vast majority would not have voluntarily migrated. Further, it’s likely that their life (or even their children’s) was worse as slaves in the US than it would have been in Africa, though this isn’t completely clear — they may have been enslaved in Africa in worse material conditions. But there’s strong reason to believe that their descendants today are much better off than the descendants of comparable people who stayed behind in Africa (as can be seen from a variety of health and development indicators). The point here isn’t to endorse slavery, but rather to point out that migration could benefit potential descendants even if it is a net loss for the migrants themselves. (Even if this were true, I don’t think it would justify coercing people to migrate, let alone endure slavery, so that their descendants can lead better lives than the counterfactual. There are other ways of encouraging migration if migration levels are lower than optimal). In a subsequent post or posts, I’ll look at empirical data relevant to weighing the above considerations and at possible ways to encourage or discourage migration to fix any “market failure” that might occur under open borders. We’re experimenting with switching the frequency of our link roundups from weekly to biweekly (twice a week). The current plan is to publish link roundups every Tuesday and Friday. See here for all link roundups. As usual, linking does not imply endorsement. Migration, Security and Development: Understanding the Linkages by Khalid Koser and Jerome Elie, People Move blog (World Bank), February 18, 2014. Immigration bill contains a state power-grab over marriage by Ian Dunt, politics.co.uk, October 22, 2013. Ethics Watch: Alien Status and Bar Admission by Megan Zavieh, attorneyatwork.com, February 24, 2014. Students launch selfie campaign to protest against immigration bill: Students and staff at the University of Sheffield take selfies to oppose government policy on immigration by Abby Young-Powell, The Guardian, February 24, 2014. U.S. top sending country; India top receiving country by Pew Research Social & Demographic Trends, February 20, 2014. Laura Ingraham’s Poor Response to George Will on Immigration by Alex Nowrasteh, Cato at Liberty, February 24, 2014. This was in response to an article by Laura Ingraham critical of a column by George Will about immigration (specifically, Hispanic immigration) to the United States. See also the Open Borders blog post The Tanton memo and restrictionism among US Republicans by Vipul Naik. Mexican Emigration and a Failed State: The self-defense groups in Michoacán, Mexico by Peter Andrews, Center for Immigration Studies, February 2014. See also a Twitter discussion in response, started by Alex Nowrasteh. 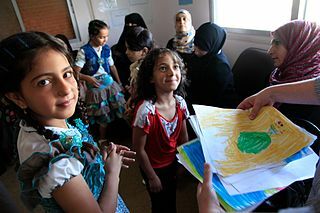 Hard-fought Utah immigration laws may be repealed: Need federal waiver » Without action by Congress, sponsor says repeal may be best by Lee Davidson, The Salt Lake Tribune, February 24, 2014.
Review: Bad News for Refugees by Lee Bunce, Post Magazine, February 25, 2014. This is a review of the book Bad News for Refugees by Greg Philo, Emma Briant, and Pauline Donald, based on research by the Glasgow Media Group. Biweekly links roundup 09 2014 is licensed by Open Borders Admin under a Creative Commons Attribution 3.0 Unported License.